I have a terrible, dark, dirty confession. Call it cussedness, professional jealousy, Oedipal resistance to a celebrated comic writer, or call it impudence, but since our subject here is truth, I may as well say it up front: for decades I was not a great fan of Molière. Even Richard Wilbur’s delightful and definitive translations, which provide an almost word-for-word rendering of Molière’s work by a master American poet, didn’t do it for me. Raised as I was on Shakespeare, I wanted more sensuality in the language and more dimensionality to the characters. Most of all, Molière’s ramshackle plots never satisfied me. (How could he wait until the third act to bring on Tartuffe?!) Of course everything from the food you like to the people you desire is a matter of taste and you might say so was this. I simply didn’t respond to Molière’s flavor. 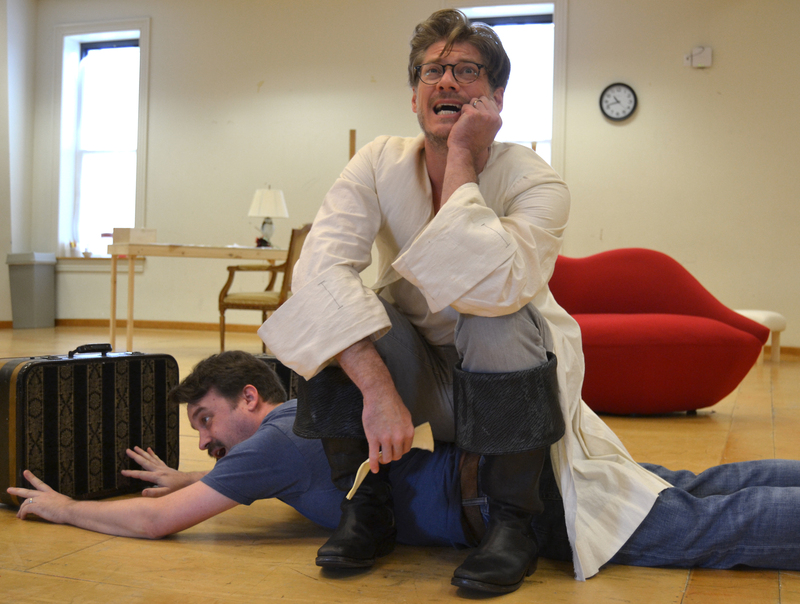 Michael Glenn and Gregory Wooddell in rehearsal for The School for Lies. Photo by Rebecca Watson. So how did I end up adapting his Le Misanthrope into The School for Lies? And what did I learn from this about me and Monsieur Molière? The project was ideal. At that point I had just adapted Corneille’s The Liar for Michael Kahn here at STC and felt fired up for another plunge into 17th-century France. Also, they felt like sister plays. The Liar is about a man who can only lie; Le Misanthrope is about a man who can only tell the truth—or the truth as he sees it. I hoped that adapting Le Misanthrope would give me a chance to dig into Molière and learn to appreciate his art. It was a play I’d gone back to again and again over the years with a weird fascination, as if a return visit could crack the secret of this strange hybrid of comedy, drama and satire. If you don’t know the story, Alceste is a universal grouch who’s in love with a flashy young society widow named Celimene. Molière’s own wife played Celimene to Molière’s Alceste in 1666, in what turned out to be art mirroring life: they were having marital difficulties and, as Alceste, the playwright got to shout at his wife about moral laxity for a couple of hours. Maybe that accounts for some of Alceste’s excessive crankiness. It was in any case Alceste who fascinated me, a man eaten away by cultural disgust, raging away at center stage for the entire play—a juicy temptation for any playwright. What I could not understand and had never understood was the play’s love affair. How in the world had Alceste, this puritan enemy of sentiment, fallen for a witty young widow? What had put these two in the same room in the first place? And how could Molière cheat us of such a rich chance for character comedy? So I did what I always do in such situations. I asked myself: given this material, what would Shakespeare do? First, I made an executive decision that this play was a comedy and, since I was going to take some serious liberties with the plot, I changed Alceste’s name to Frank and the title to The School for Lies. Reading Le Misanthrope over and over and taking notes, I hit upon what seemed a fitting romantic tangle and a backstory that kept the lineaments of the Molière original. As with The Liar, I worked directly from the French, producing what is neither translation nor adaptation but what I call—aptly, for such a hybrid play—a translaptation. In the end, The School for Lies premiered at CSC to considerable success, I’m happy to say, and I quickly left it behind to start another project. Now those are dark, demoralizing words for any playwright. Look at the play? Look back at The School for Lies, which was finished and perfect, sublime, if not immortal? Then, hélas, I looked at the play. By page three I had my pencil in hand and was crossing out long passages of perfect, sublime, immortal dialogue. But that’s the thing about the theatre: it’s a school for truth. Actors have to listen and respond truthfully and playwrights have to accept the truth about a play, even if it means wholesale rethinking and revision. Most importantly, the revision process for STC led me to a larger truth: that maybe my long-time distaste for Molière (and my fascination with Le Misanthrope) stemmed from my own misguided cultural crankiness. A misanthrope is someone who by nature wants the world and humanity to be different from what they are. I was falling right in misanthropic line by asking Molière to be something he is not, to be a kind of playwright he is not. I wanted him to be Shakespeare, something he never set out to be. (And couldn’t have, since he’d never heard of Shakespeare.) I realized I had spent decades desperately trying to transform French fries into shepherd’s pie instead of dolloping on the ketchup and simply enjoying the fries. And so, thanks to Michael’s pointed comment and his perennial theatrical wisdom, what you are seeing at STC is a thoroughly reworked The School for Lies. Thanks to the revision process, I was afforded a glimpse of my own brand of grouchiness. As for you, Monsieur Molière, I owe you profound apologies—and many evenings of drinks over pommes frites. I couldn’t have done this without you.